Today's business environment demands both dependability and functionality from telephone communications systems. 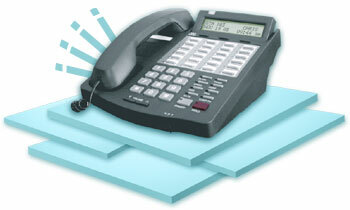 Vodavi StarPlus electronic key telephone systems meet this challenge with reliable systems that provide a wide range of features and capabilities. The Vodavi STARPLUS 308 supports up to 3 lines and 8 stations and has features normally found in large systems. It is the perfect starting point for any small business. The 616 adds additional enhanced features to the 308 capabilities with 6 lines and 16 station capacity. The 1224 provides 12 lines and 24 stations to accomodate an even larger office environment. The microprocessor based architecture of the Vodavi STARPLUS Electronic Key System combines digital control and stable, trouble free operation. A wide variety of features are found in every system which adds sophistication usually only found in larger telephone communications systems. Some of the features that improve call processing include Attendant Station, Hold Recall, Direct Station Selection, Busy Station Indication, and one touch Call Transfer. The Vodavi STARPLUS 616 and 1224 add several more features, including User Programmable Buttons, Display Phone Operation, and SMDR Output. Vodavi STARPLUS Electronic Key Telephones are available in three models; Basic, Enhanced and Executive. The Basic model is a 14 button key telephone that provides features such as Call Announce Intercom, Paging, and On Hook Dialing. The Enhanced model adds Full Speaker Phone capability and has 30 buttons for accessing lines and features. The Executive model incorporates Enhanced model functionality plus a 48 character, interactive display. Vodavi STARPLUS Key Telephones are as pleasing to the eye as they are functional. Each model comes in four designer colors: Burgundy, Black, Gray and Ash. Click here to learn more about Vodavi's StarPlus Electronic Phones.